Netflix is pushing more and more original content, driving the company further into debt in an effort towards expanding its business. The online streaming giant has been investing billions of dollars on TV shows and movies, putting services like Blockbuster and other movie rental stores out of business. However, the online video streaming company faces record debts as it embarks on corporate restructuring to rein those costs in. 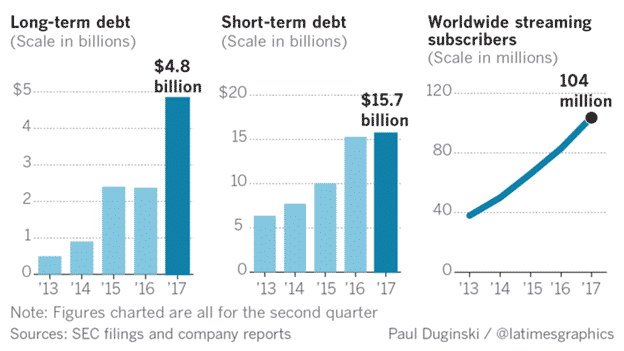 Netflix’s long term debt stacked up to $3.36 billion last year. Since then the debt has been piling up exponentially. Now the company’s long term debt amounts to $4.84 billion. Majority of that money is used for licensing third-party TV shows and movies, in addition to financing their own shows and movies. The streaming giant has come into a revolving credit agreement to borrow $500 million through five lenders including Deutsche Bank AG, Goldman Sachs Group Inc., JPMorgan Chase & Co., Morgan Stanley and Wells Fargo & Co. According to the company’s filing, they believe in using the amount for “working capital and general corporate purposes,” as well as to carry on having negative free cash flow for a few years to come. Netflix has 104 million subscribers from around the globe. The company’s efforts to produce more original content is a major reason behind its $20.54 billion debt.